Two large M&A deals breached the US$3b mark in H1. Overall Singapore merger and acquisition (M&A) activity jumped 19.1% to US$33.8b so far this year, reaching the highest first half period since 2014 at US$54.6b, Thomson Reuters revealed. According to data as at 18 June 2018, the average M&A deal size for disclosed deals grew to US$127.1m compared to US$86.8m in the first half of 2017, as Singapore-involved M&A this year witnessed two deals US$3b and above. Temasek Holdings bought Bayer AG for US$3.7b whilst Quartz Holding entered a deal with Investa Office Fund for $3.04b. During the second quarter of 2018, Singapore’s deal activity amounted to US$21.6b, up 76.8% from last quarter and up 23.4% in value from last year. Total cross-border deal activity fell 11.8% to US$16.8b. Inbound M&A activity fell 51.9% whilst outbound M&A activity increased by 24.5%. Domestic M&A activity jumped 7.5% to US$3.8b even if the number of domestic transactions was down by 22.9%. Real estate (43%), financials (16.8%), and industrials (15.8%) sectors accounted for a combined 75.6% market share of Singapore’s domestic M&A activity. Completed M&A deals involving Singapore amounted to US$35.7b so far this year, a 29.4% decline in value compared to the first half of 2017 (US$50.6b) as the number of completed deals fell 9.2%. The real estate sector took the lead and accounted for 30.9% of the market share worth US$10.4b. M&A targeting the materials sector totalled US$4.7b, driven by the Temasek Holdings-Bayer AG transaction, which is currently the biggest transaction involving Singapore so far this year. Media & entertainment saw a record first half period with US$4.3b and accounted for 12.7% market share as deal value grew 284.6% from a year ago. Meanwhile, buyside financial sponsor M&A activity in Singapore saw US$166.2m worth of deals so far this year, down 91.7% in deal value from the comparative period last year. This is the lowest first half period in terms of deal value since 2013, but the number of private equity-backed acquisitions grew 14.3%. Foreign acquisitions targeting Singapore-based companies reached US$4.3b so far this year, down 51.9% in deal value. The retail sector accounted for 46% of Singapore’s inbound M&A activity and totalled US$2b, up 99.5% from the first half of 2017. 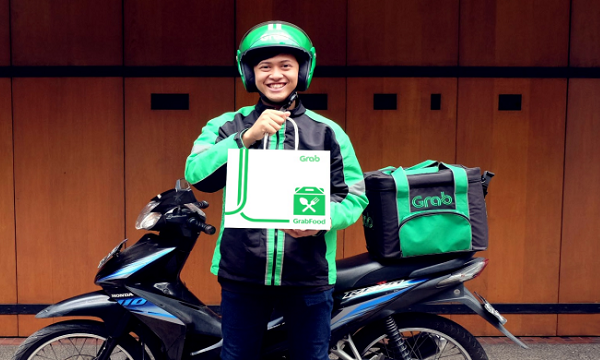 Thomson Reuters noted that Alibaba Group Holding of China planned to raise its interest in Lazada South East Asia for US$2b, in a privately negotiated transaction. The deal also pushed China as the most active acquiror in terms of deal value, capturing 50.0% of Singapore’s inbound activity. Japan followed behind with 25.9% market share, whilst the US represented 7.1% market share. 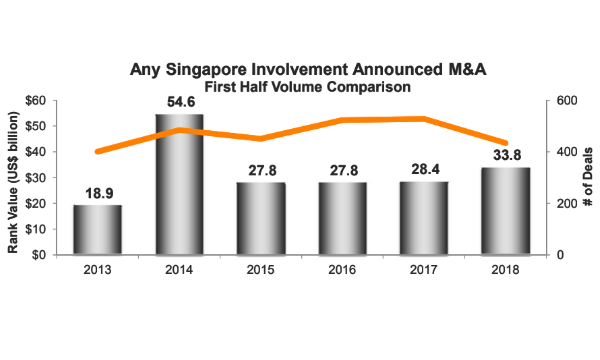 Singapore outbound M&A totalled US$12.4b so far this year, up 24.5% in deal value despite a 23.2% drop in the number of announced outbound acquisitions. The materials industry is the most targeted sector thus far, capturing 36.9% of Singapore’s outbound activity, with US$4.6b worth of deals. The Temasek Holdings-Bayer AG transaction bolstered Germany as the most targeted nation for Singaporean overseas deals so far this year in terms of value, accounting for 29.8% market share. Singapore’s overseas acquisitions in India reached US$1.9b so far this year, up 107.0% from a year ago. The United States, China and Vietnam accounted for 13.1%, 12.1% and 10.6% market share, respectively.